We just had a nightmare occur at our house that gratefully has been remedied, but with expense, time, and much aggravation. We had our ceiling textured as we finished our basement. Unfortunately, neither one of us was home when the job was complete. I can’t even describe to you the mess it was. So as not to give myself a headache recapping all that went into this fix, I will not deliberate any longer. But it does bring up the subject of ceilings. Let’s think outside the textured box (wish I had) and take a look at some fantastic ideas for a much overlooked surface in our homes. 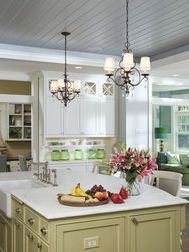 Here are some cool ideas to add such a punch to any ceiling. I especially like the use of some of these ideas in a basement family room. Skylights for an upper room ~ does amazing things and doesn’t have to be scary any more. Check out Solar Tubes. 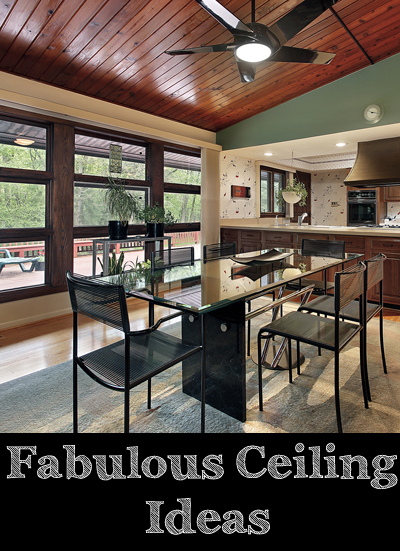 So, if you’re thinking about remodeling, building, or just need a change, think about re-doing a ceiling. There are so many possibilities.